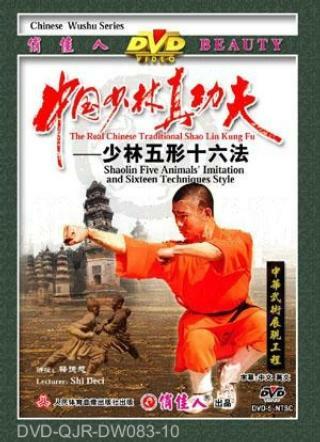 Shaolin 5 Imitations and 16 Techniques (Shaolin Wu Xing Shiliu Fa) is a type of imitation fist (Xingyi Quan). This routine imitates five creatures with their distinct combat abilities. The movements include rooster peck, horse kick, tiger jump on, rabbit kick and dragon writhe. From these sixteen different types of skills of hand, step and leg were evolved. The change of the techniques is hidden in the coordination of the imitations and the movements are ferocity, cunning, practical in combat for attack or self-defence.